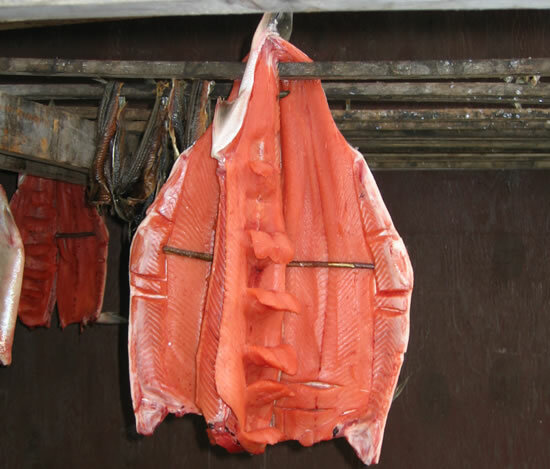 Martha Perry from Tuntutuliak used her uluaq (semilunar knife) to make her inherited fish trademark, or neqem cetra, by cutting three short horizontal lines two side by side and a third slightly higher on each edge of this piece of chum salmon. Tua-i tuaten aturaqtullruaput neqet qeciit. Fish skin was our clothing back then. Fish supplied more than food; they also gave humans the skin off their backs, providing a flexible and waterproof material used to construct boots, mittens, bags, parkas, even thread. By smoking the fish skin, water is driven out slowly without changing the flexibility of the oily skins. The water loss also minimizes bacterial growth, which would let the skins deteriorate. Cegg'aq, kemga tua-i nererraarluku, tamakut (qeciit) qelkaqluki. Tua-i-ll' qavciureskata-am tua-i ervigluki tua-i. Teq'ut, angutet tequit, ala-i tuknillinilriit tang! Miilatun ayuqluni. Fish that was dried and smoked, after eating the meat, they'd save their skins. Then when they had several, they'd wash them [in urine]. Aged urine, men's urine, my goodness, it apparently can get very pungent! It worked just like detergent. Fish skin is made up mainly of collagen, the same protein that forms the connective tissue found in the skin and bones of all animals. Collagen can be broken down by certain enzymes, some of which are found in dog feces. So if you step in a dogpile, you may expose fish skin soles to enzymes that can break down the network and cause them to fall apart. Neqerrluut (qeciit) nat'raqtuluki, pilugukluki. Wiinga-am tua i pingqellruunga, nat'rarluteng ilameggnek. Inerqurnauraatnga ankuma qimugtem-gguq anaanun tus'ucaqunakek nat'ragka. inerqutullratnek qimugtem anaanun tus'utesqevkenakek. Tua i-am picsaqlua qimugtem anaa tull'uku, murilkevkenii-ll' (tuqaarluku) ellami qanikcami aquiluta. Tua-i-ll itrama piatnga, "Tua i-am tus'utlinian nat'rarpet aipaa." Tangrraqa taun' tus'utelqa nangllinilria. Wagg'uq tua i qimugtem anaanun tus'utellriani ar'uqertetuut tamakut. Tua i nallunrirluku wiinga. 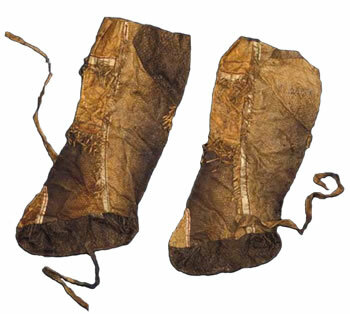 Dried-fish skins were used as boot soles and as boots. I had boots like that, too, with fish-skin soles. They'd warn me not to step on dog feces when I went out. Then I got curious, so I stepped on dog feces and continued to play on the snow with others outside. When I went inside, they said, "So you have stepped [on feces] with your other foot." I looked at my boot's sole, and there was a hole where the dog feces was smeared. Then I learned that fish-skin soles could rot very quickly if one stepped on dog feces. So I learned from that experience. 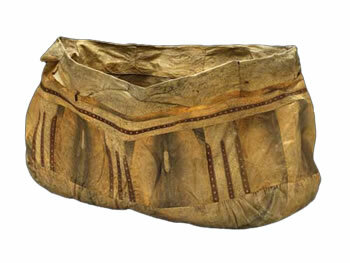 Wassilie Berlin said: "When the son of a couple got married, a bag like this would be brought out filled with garments for the bride." Salmon skin sewing bag, among a woman's most valued possessions. 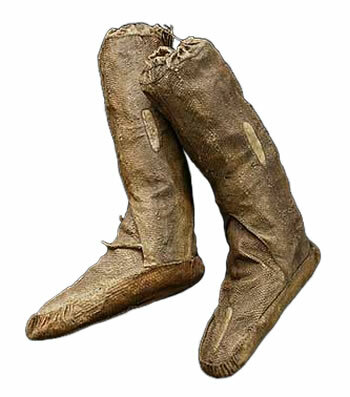 Fish skin boots from the Yukon delta, with white patches where the fins had been. Frank Andrew said: "I never took off my fish skin boots during winter, and my peers were probably the same way." 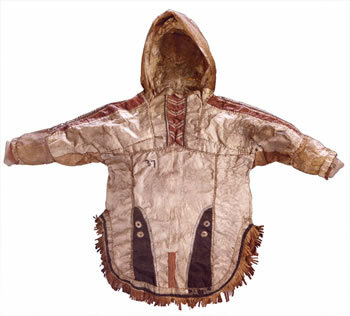 Fish skin parka Frank Andrew said: "Kwethluk people scattered pike on glare ice. When they stuck, they pulled them up, removing the scales. They looked like cloth and seemed soft when worn." 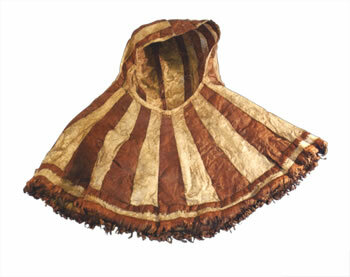 Yuraryaraq/Woman's hood made of strips of dyed fish skin, from the Yukon. Fish-skin boots from Nunivak, made with dyed skin and wolverine tassels. Wassilie Evan noted: "Your feet get cold in boots that are too tight, but larger clothing is warmer and can be filled with grass." 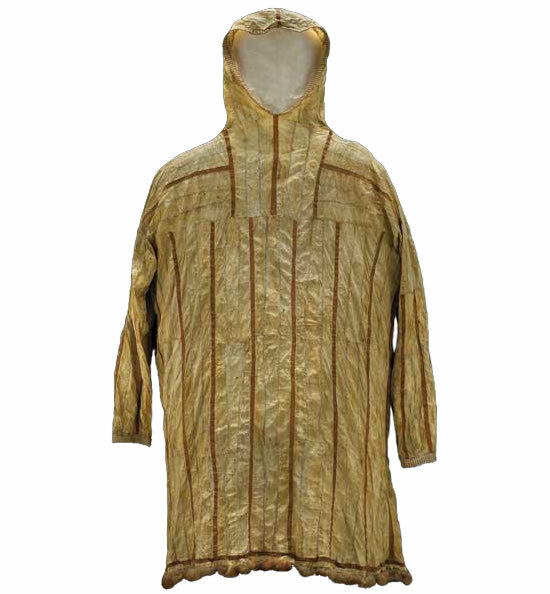 Qasperrluk/Fish-skin parka made by Lena Atti of Kwigillingok from twenty-four chum salmon skins. 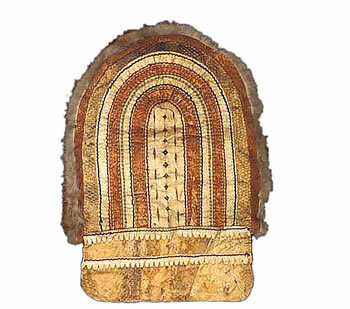 The oval patches cover the places wehre dorsal fins have been removed. Yuilqumi pelatekaqluki aturaqluki. Uksumi-llu angutet unicuunaki uksumi yuilqurtaqameng tamakut qasperrluut, iqertiit. Atuqata'arqamegteki, imkut tugret, cikuliurutet, kapulluki waten carrirraarluku, nacaat-llu tua i at'elluku pikavet cikuliurutem kangranun, mat'umek nungirutiinek qillrulluku, umcigtevkenaku taugaam pikna, elcugngavkarluku. Aliit-llu tamakut ilutmun murugtelluki waten. Ilulirnerkun camaggun ukatmun pivkarluku, nanerluku qamaggun, eneketuluki. They used fish-skin parkas as tents out in the wilderness. And men never left them behind during winter when they traveled out on the land. When they were going to use them, they stuck the ice pick in the ground after clearing the area, and they placed the hood over the ice pick's top, loosely tying the fastener on so that the air could circulate. And they pulled the sleeves inside. Then they put weights around the inside bottom and used it as a shelter.